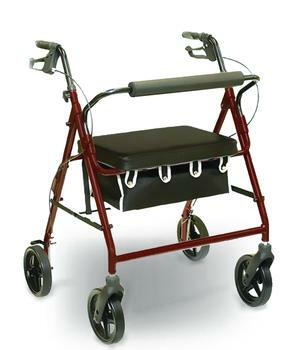 Lightweight and strong, the Bariatric Rollator provides users with reliable mobility. 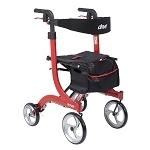 A welded aluminum frame and large, 8" front and rear casters allows for smooth gliding over just about any terrain. 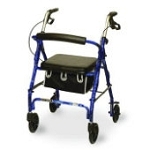 Locking loop brakes are easy to use and secure the rollator safely when using the seat or remaining stationary. Generous dimensions, a large, padded seat, and padded backrest provide comfort. Also features storage basket located conveniently under the seat with plenty of storage space. Adjustable handle height accommodates a wide range of users. 400 lbs weight capacity. Handle Height: Adjusts from 33.5" - 38.5"
Seat Dimensions: 19" x 13"
Q: How wide is this at the wheelbase? Thank you for inquiring with IndeMedical.com! The overall width for the Bariatric Rollator is 26". As of 10/1 it is in stock. You can order online 24/7 or give us a call at 480-704-3807. Was this answer helpful? 60 of 60 Customer(s) found this Answer helpful.